Making pots that people use to feed each other, I use material objects to explore the boundaries of subjectivity and engage our sense of self-and-other. In feeding events, my forms bridge the space between two subjectivities, each one reaching out with empathy and receiving with vulnerability. Staging food events using handmade pottery offers a multisensory experience that wholly engages participants. The material encounter is an intervention across the fluid boundary of subjective space, prompting awareness and questions. Visual experience is put into its place as the objects almost disappear from sight as people focus on the meaning and significance of their experiences. Making pots that people use to feed each other, for example, I use material objects to explore the boundaries of subjectivity and engage our sense of self-and-other. In feeding events, my forms bridge the space between two subjectivities, each one reaching out with empathy and receiving with vulnerability. In the guise of chef and server I place myself within the event to observe interactions and collect feedback. My relationship with participants continues when they reflect upon their experience in writing to me. Rooted in tradition and practicality, utilitarian ceramics actually can serve as radical, transformative art. Experience with handmade pottery can alter the scripts by which we interact around food. 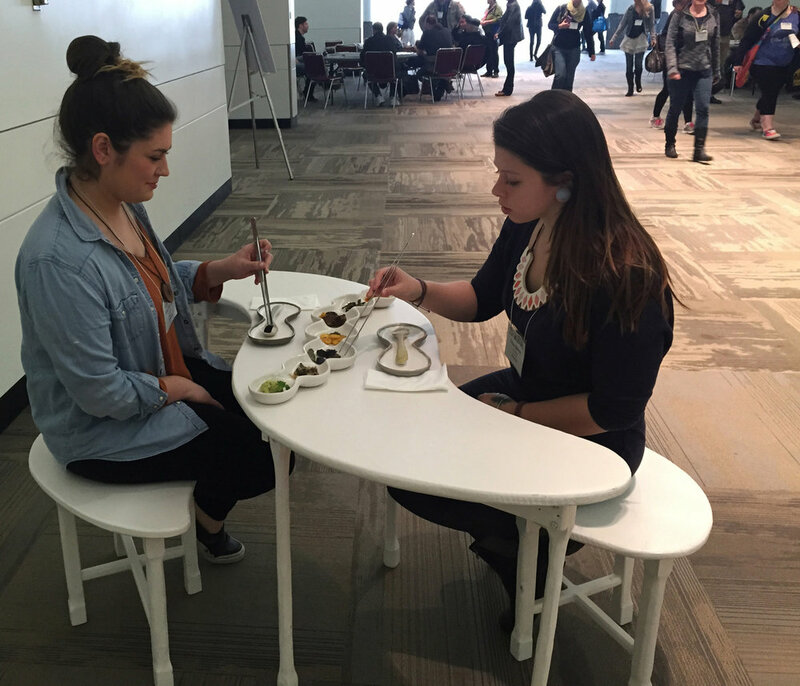 Through engagement with the work during a food event, participants are challenged to reflect upon their sense of self and other and emerge with a new awareness of the symbolic meanings of food behaviors and a renewed sense of connectedness. Read more on this project in the Studio Potter article that I wrote about it. 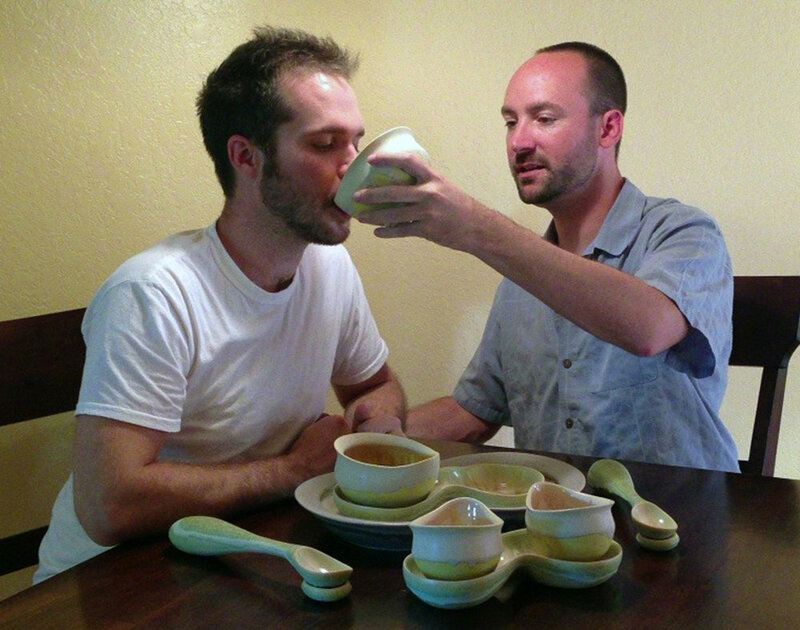 The crossing boundaries project began as a series of dinner events using a table setting designed for two people to feed each other a four-course meal that I prepared for them. 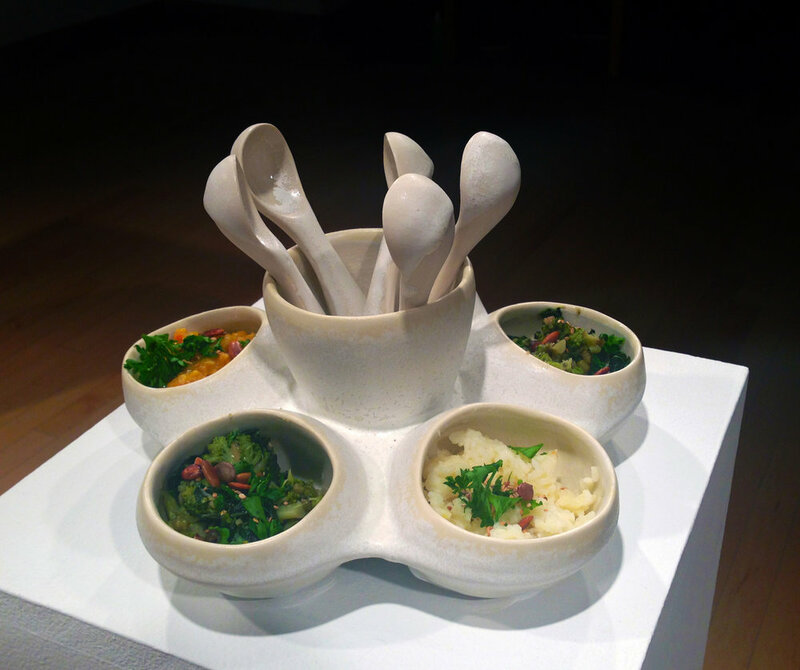 The next manifestation of the project occurred as feedback, a solo exhibition and food event held in Trisolini Gallery at Ohio University. This event was more informal, with people standing and moving around the gallery space. An added bonus happened because the hot water bath we were using to sterilize the spoons provided an unexpected warmth to the experience. Then, I took the event to the Alberta College of Art and Design for Craft Performance Week. There, five pairs of people at a time fed each other, and we had five seatings over the course of the evening. Afterwards, one participant said that she would like to be her partner's feeder for a few weeks, to fully develop a sense of empathy for that person's needs and preferences. The most recent version of crossing boundaries has been set up in the conference center at NCECA using this portable set up. It was part of the Across the Table exhibition at the Kansas City NCECA. 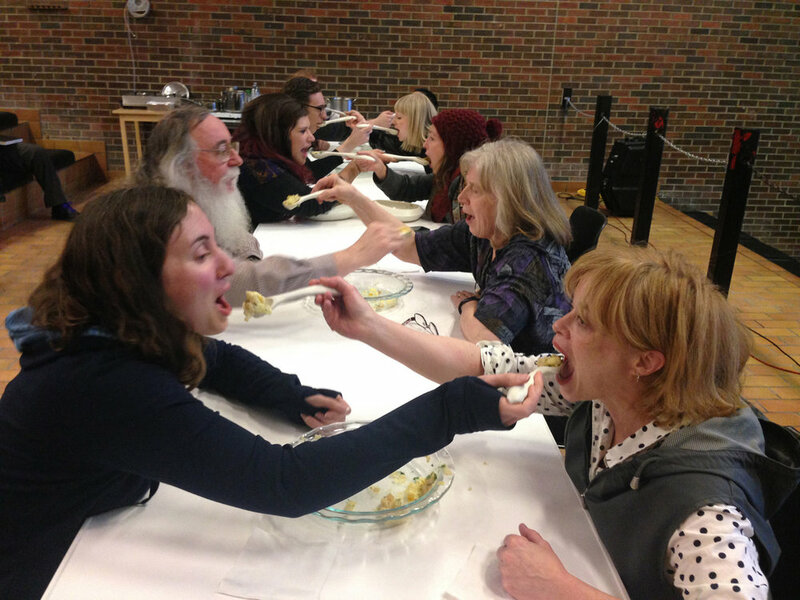 Participants used chef's tongs to build each bite on the spoons, then fed their bite to the other person.